Do you have a dental emergency in North London? We offer same day emergency treatments for patients suffering with a variety of dental issues. 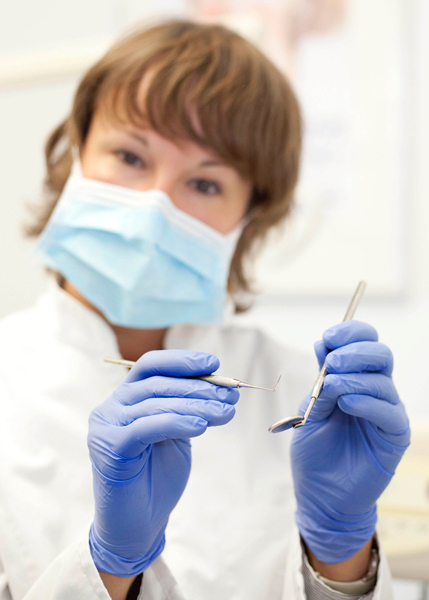 As experienced dentists, we understand how painful dental emergencies can be. We always strive to offer same day treatment to relieve the pain as soon as possible. Don’t delay, get in touch with us as soon as possible. Most of the time you will be seen same day for your urgent dental problem. Tooth Extractions: we can remove a tooth pain-free if it is badly infected and not saveable. We can perform extractions of impacted wisdom teeth and retained broken roots. Dr Monika has superb experience in removing teeth. It usually doesn’t take long and it is always as comfortable as possible. She can remove very difficult teeth with ease and confidence. In February 2016 she went on volunteering mission to Tanzania with Bridge 2Aid charity to teach local clinical officers to remove teeth safely and pain-free. You can read about her expedition here. Please rest assured, if you need a tooth to be taken out you will be in the best and safest hands. *****‘I needed emergency dentistry – got an immediate appointment and skilled and considerate assistance. I recommended the dentist to my son and would go again.’ Burry C.
*****’I wouldn’t go anywhere else I have no complaints after signing myself up in 2012. Highly recommend them. Fantastic dedicated service.’ Jen J. As well as dental emergencies, Blue Light Dental also perform a range of cosmetic and restorative dentistry. White fillings we use the best composite materials to restore broken or decayed teeth. The IPS Empress Direct is used to achieve the highest aesthetic result in anterior and posterior teeth. It is light-curing nano-hybrid composite material and we have chosen it because it allows us to mimic the appearance of a natural tooth. It also gives long-term shade stability and strength. *****’Monica has been doing my teeth now for the last 7 years or so. She started fixing my teeth at another dentist closer to where I live and when she moved to open her own practice even though it was much further for me to travel to it was a no brainer to move to her new surgery and keep seeing her. Always very attentive and honest. I recently had 2 (white) fillings at the top of my mouth and honestly you cannot tell at all. Furthermore, I was in and out within 90 minutes. In addition, I also had a clean on this visit which was great as I have had cleans from other places which have left me in pain. Point being I would definitely recommend the Blue Light Dental Clinic’ Kim F.
Dental Crown is needed to restore a heavily decayed or broken tooth. There is a choice of several materials and we will advise you on the best material. We usually recommend e-max crowns (pure porcelain crown) for front teeth which form the aesthetic zone of your mouth. It will give the best match of your natural teeth, lifelike shape and size that it will make it very unlikely to be noticeable amongst your natural teeth. THEY ARE SIMPLY BEAUTIFUL AND SUPER NATURAL LOOKING! You can also have emax for the back teeth as they are very strong and reliable. Other options available. Please ask us. Dental Bridges can be used to replace missing teeth when at least some of the teeth are present and suitable for the restoration. The bridge is supported on your own healthy teeth. We can offer our patients Zirconium bridges which are most durable, visually appealing and strongest restorations comparing to other options. Zirconium is a tough option of ceramic very compatible with the body. 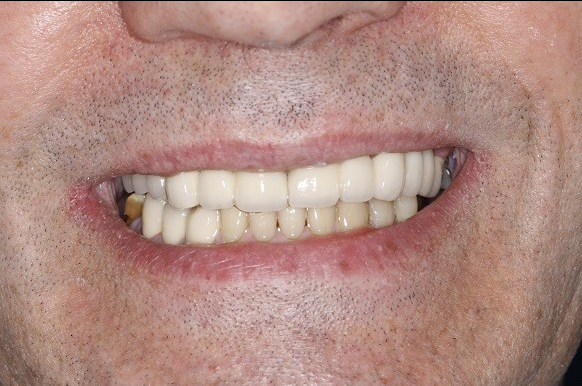 Zirconium bridge looks just great and blends well with the rest of the natural teeth. *****’Went there on a recommendation from my friend. Now I wouldn’t go elsewhere:)’ Margarita M.
Dentures are a way of replacing multiple missing teeth. We can advise you the types available and most suitable for your mouth. 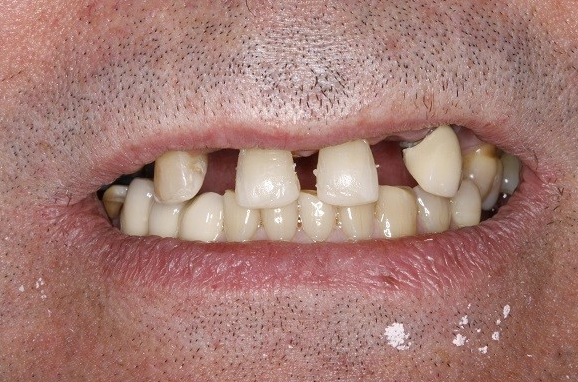 We also offer more discreet flexible dentures. Valplast is a form of nylon and is much stronger and flexible than the acrylic form of dentures. It can be practically invisible and does not need metal clasps that you most likely see in other acrylic partial dentures. Are you worried about bleeding gums or bad breath? Often bad breath and bleeding on brushing can be a sign that there is a problem with the gums and the supporting tissues of the teeth, and is an indicator that you need treatment. This is often a simple scale and polish to remove plaque and tartar and educating you about the best oral hygiene techniques to keep the germs away. If the gum condition is more advanced, your dentist might advise a more thorough assessment and intensive treatment of your gums. This is to ensure we help you hold onto your teeth for as long as possible, since untreated gum disease is known to lead to loosening of the teeth. We believe it is extremely important to help you achieve the smile you want, but also prevent any future problems with your teeth and gums. That is why we will send you a gentle reminder every six months to encourage you to come for a check-up. We will clean your teeth using an effective air abrasion equipment to achieve a spotless smile. You will feel so cool and refreshed! We also supply various oral hygiene products, such as electric toothbrushes, for a discounted price. Contact us today to book in a check up. Prevention is better than cure. We will examine your child’s mouth, apply fluoride or recommend fissure sealant. You will receive a lot of advice how to look after his/her mouth, what food to avoid and what food to encourage. 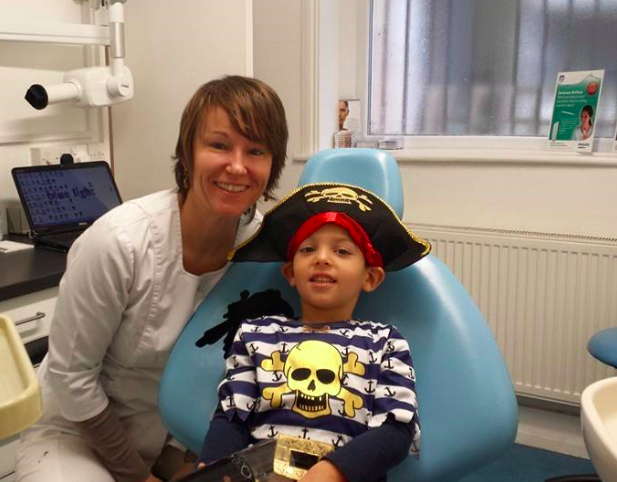 Our friendly team will spend time to make them feel at ease and comfortable when visiting the dentist. We believe in learning good habits from a young age and make learning about teeth and brushing fun!